Late on a fall day in 1974, Derek Reist ’67, M.B.A. ’69, was walking from his rent-controlled apartment/artist’s studio in Manhattan to the Harvard Club to play squash. His work had already been featured in several Manhattan art galleries, and he was at least eking out a living as a painter. But he was still engaged in a sometimes frustrating search for an artistic vision. While crossing a street, Reist looked up and spotted a rooftop water tower, bathed in the sunset’s orange light. He was transfixed. Caravaggio, de Chirico, Vermeer, Hopper, and “all the Impressionists” are influences Reist cites: “I was drawn to guys who incorporated light in their work.” His own canvases are large and substantially more dramatic than their online renderings: the sun-struck portions emit a fiery glow, while the cool, deep shadows feature subtle differentiations among purples and deep blues. 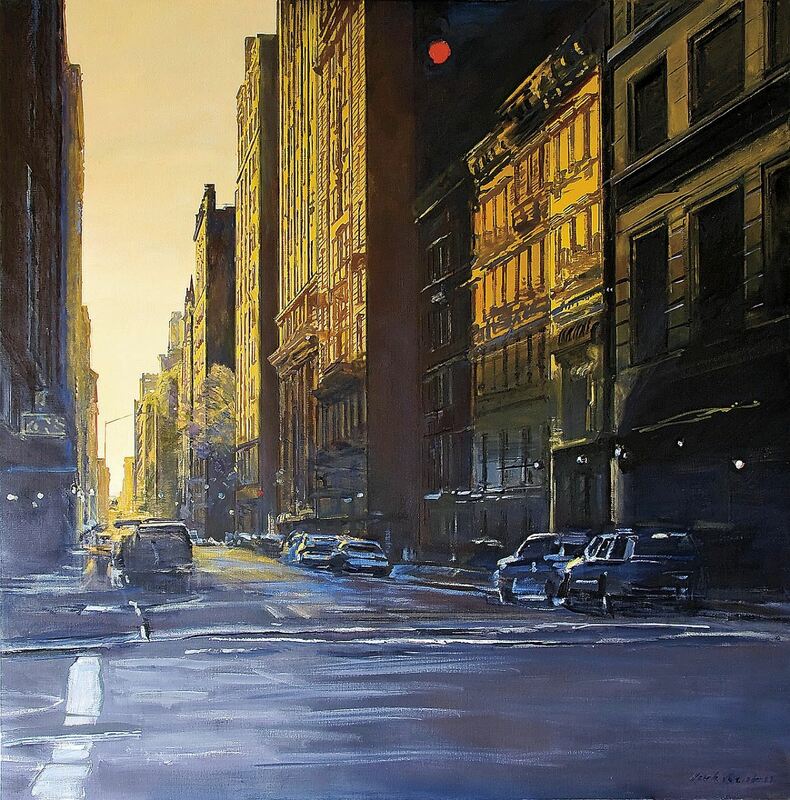 Downtown Gold and Midnight (reproduced above) in different ways exemplify Reist’s approach. His is a personal and private view of New York—composed of human artifacts, but devoid of human figures, with sky the overarching presence. In Downtown Gold that yellow-gold sky subtly varies from warm to decidedly cool as it stretches from the horizon to the zenith. The buildings gleam with an almost luminous and much redder gold. Cool, almost icy shadows bathe much of the surface, yielding carefully rendered details. 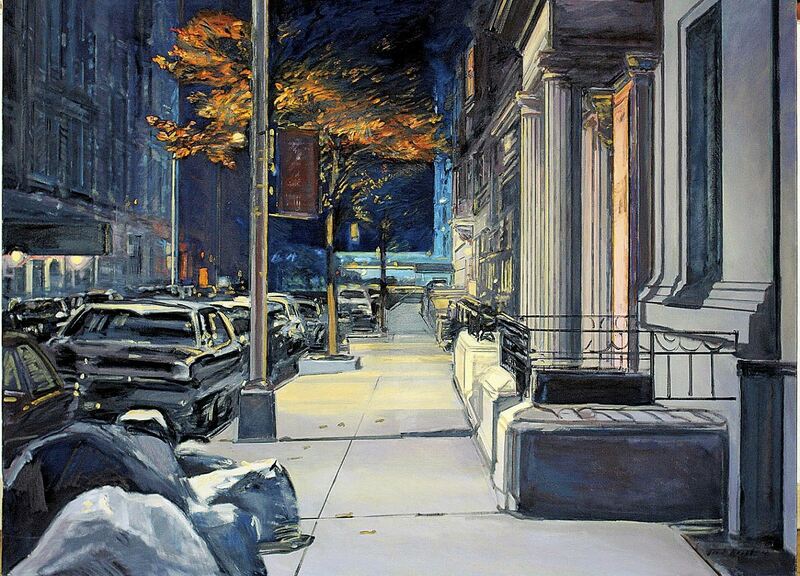 In Midnight, the sky is an inky void, with the street, sidewalk, and trash bags painted in cool tones. The sparse warm highlights provided by the doorway of a brownstone and a bit of autumnal foliage illuminated by streetlight only serve to emphasize the chill of a fall night. Though Reist dates his real career as an artist to that moment on a Manhattan street, his artistic roots trace back to his childhood in Peru, where his father was an American military attaché married to a Peruvian. 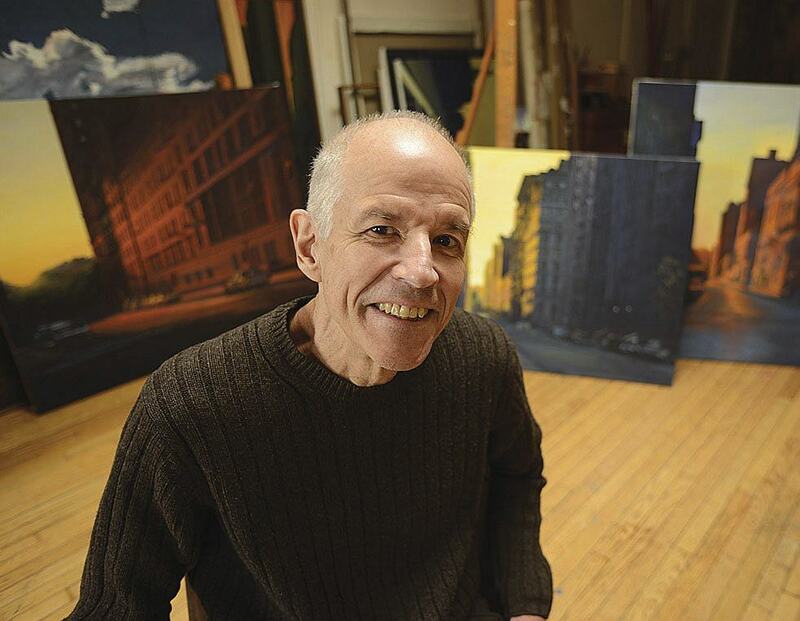 Reist began painting in prep school; in college, the Adams resident took a House course on life drawing taught by Boston University professor Morton Sachs. “Morton taught me how to see with a pencil,” Reist recalls. “I learned how to translate three dimensions to two, but in a way you could still see the three dimensions.” Sachs encouraged Reist to consider painting as a career.